Bloodhounds are a fascinating breed of dog. Their recorded history goes back over two hundred years to the 18th century! Let’s find out why this is. Let’s have a closer look at some interesting and – and perhaps unknown – facts about this magnificent creature. Bloodhound puppies may start out small and cute but they don’t stay small for very long. In fact they grow at a rate of three to five pounds per week! Because of this, it’s best that bloodhound puppies walk, run and play on softer surfaces such as grass or mulched walking trails. Try to avoid hard surfaces such as road or concrete as this could hurt the heavy puppy while its bones are still soft. Bloodhounds are social animals. They need company and will get depressed if left alone. The best environment is one where there are other dogs and / or people around during the day. Because bloodhounds are such gentle, loving, and friendly dogs they are not ideal for guarding duties! They can sometimes seem stubborn owing to their strong tracking instincts. In fact, bloodhounds are nearly unstoppable once they have picked up on a scent and started tracking it. Their skills are so advanced that they can pick up a smell from just one or two skin cells. They are so highly regarded and trusted that almost any court of law will accept the testimony of a bloodhound’s nose! The Thrapston Association for the Prevention of Felons in England first used a bloodhound to help find poachers and thieves in 1805. Nowadays their role in law enforcement is almost legendary, and they have brought many dastardly criminals to book. Tradition holds that the Monks of St. Hubert began breeding bloodhounds in Belgium in the 8th century.They called them them their Saint Hubert Hounds because they were such fine animals. However we can’t be absolutely sure the animals were the same. 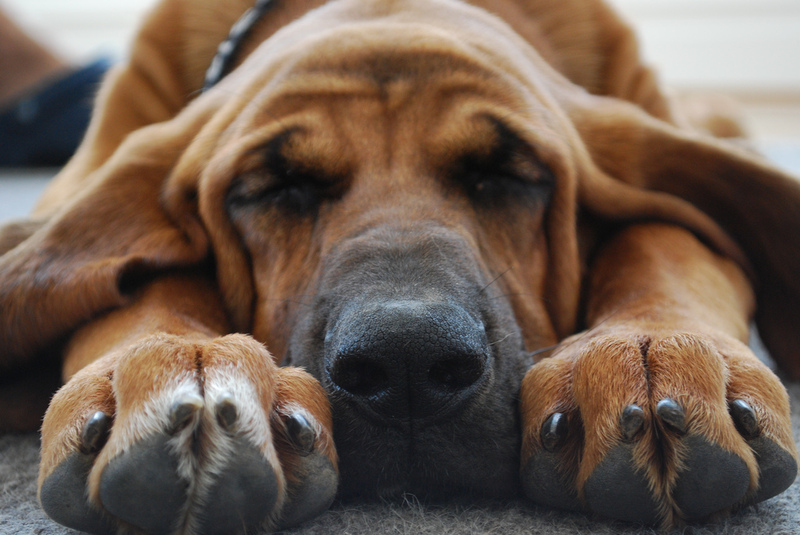 What we do know is bloodhounds have a ancient pedigree that goes back centuries.